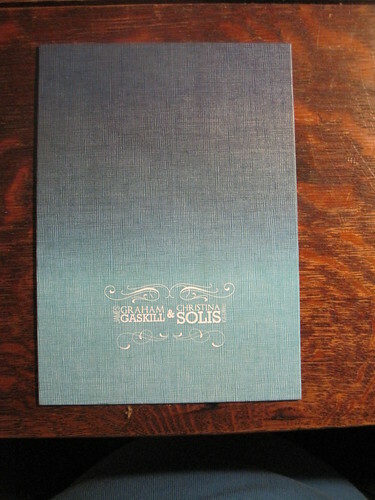 Invitations are ready to go! 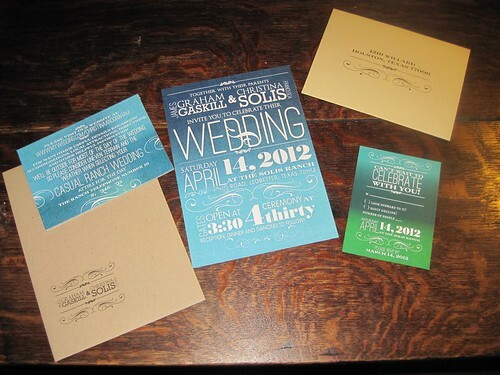 After the various hiccups with the invitations, they finally all arrived. And now, they're assembled, stuffed, stamped and addressed and ready to go to the post office in the morning. Stamping was a bit of a challenge, only because I tried to go to the post office at lunch to pick up the stamps for the invitations. Unfortunately, the post office I went to didn't have one of those self mailing machines, so everyone who went had to stand in line. There were eight people in line ahead of me, and the two people at the counters were dealing with complicated issues (a passport application and a large package that required lots of tape and all sorts of forms). After standing in line for 15 minutes with no movement, I gave up, grabbed some take out lunch, and then headed to my home post office about four miles away. Ten minutes later I was out of there with 12 sheets of "Garden of Love" stamps and two sheets of "Love" stamps (I bought them out of the former...). Graham went across town to pick up the extra invitations and RSVP envelopes, and we met up and stuffed at home until he had to go to work. I finished up, rearranged the envelopes according to ZIP code, and double checked that we had everything. You can see these pictures on my flickr set as well, and it might be easier to see detail. The set. We had originally wanted to go with a postcard, but it turned out to be a little too small. So we had to get envelopes instead. The large envelopes were from my mom, who had over bought a few years ago. We actually used them as the starting point on this whole project. I pixelated out the address and zip code. I really loved the way she did our names, since Graham goes by his middle name and I go by my first. The names work out perfectly this way. As I mentioned before, she really liked the idea of playing off of Chrissy Wai-Ching's dip dyed dresses. 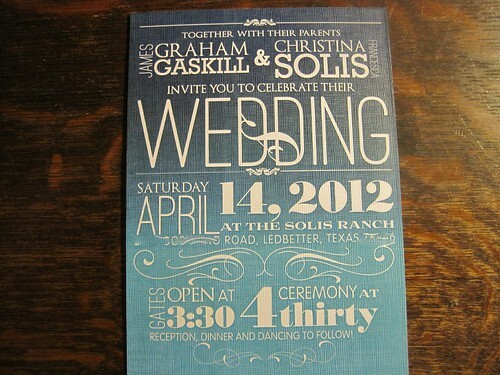 So she made the invitations look dip dyed. 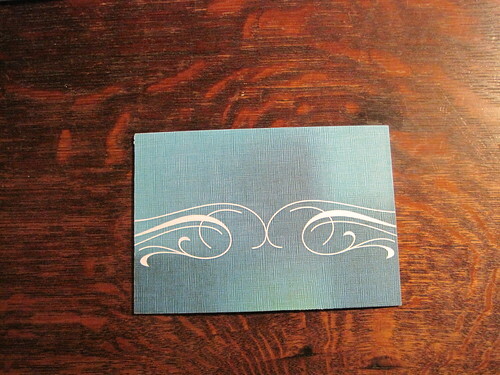 I think that she printed the color on very thin paper, and then the paper was glued onto card stock on both sides. Again, I pixelated the phone number. This was the information that we felt was essential that really wasn't invitation information. 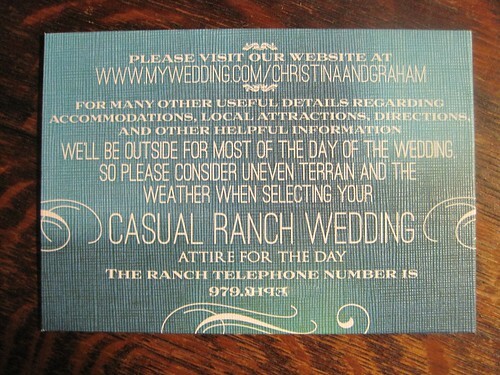 The website has most other relevant information, but we thought that the phone number and dress was important to emphasize. I really love how she paid attention to detail. Every part of this thing is just lovely. 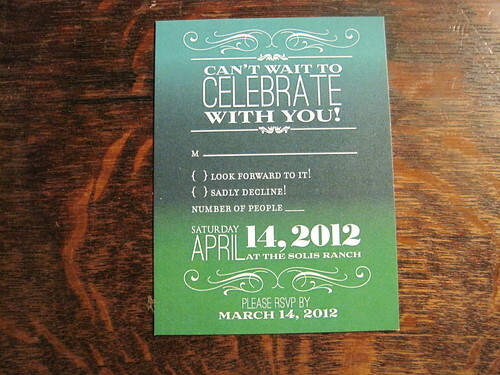 The RSVP card. It was printed on regular card stock, but it looked fine with the rest of the set. It was intended to be a post card, but it was too small. It worked out pretty well with the envelope. The whole ensemble was just at 2 ounces, and we put two forever stamps on each to ensure that postage would be adequate.